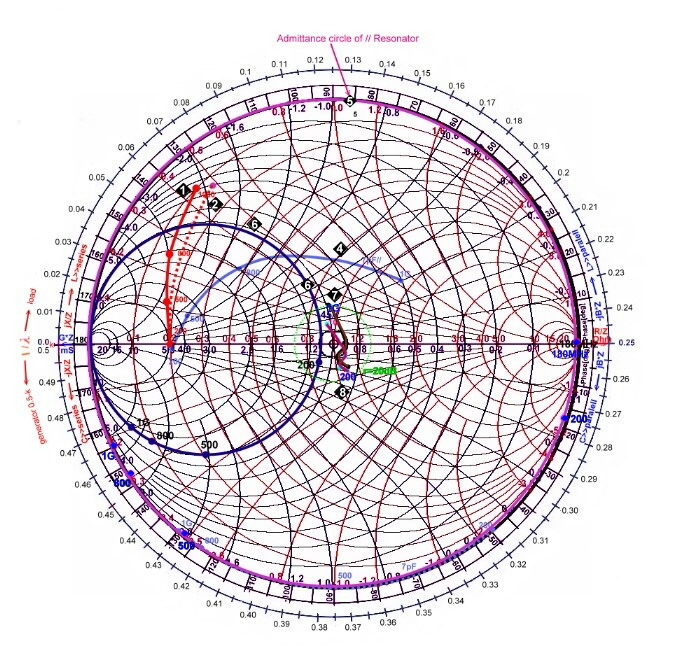 The Smith Chart , a practical electronics course. 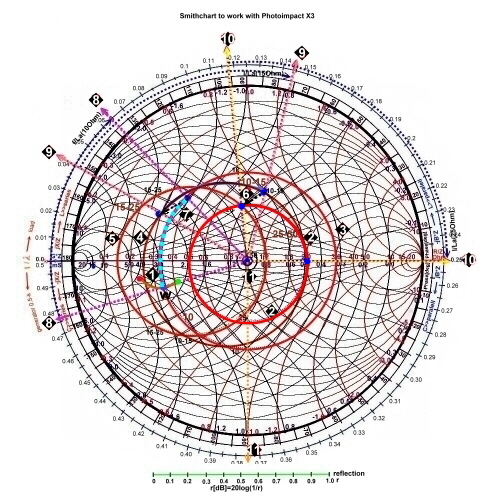 The paralell resonator in the smith chart. Matching example #3, component and tramsformer. 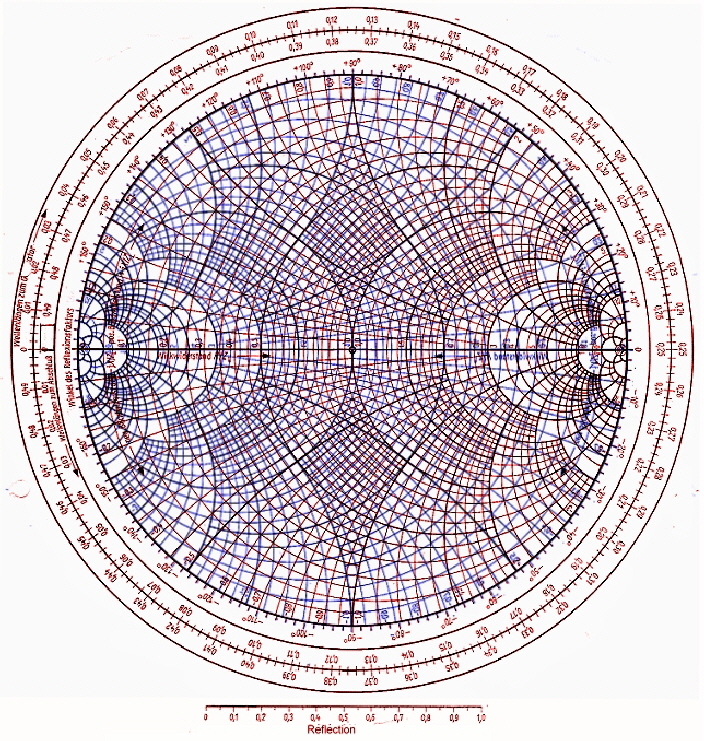 For some people, is the electronic Smith chart a secret spider's web. But its very easy to understand. Electronic reflection is the result of not matching connections of electronic RF devices, cables , connectors, PCB-wires, and so on. Fig.1 shows the situation. An RF generator is connected by a wave line on a complex load R = =W. (W=Widerstand). Now there are two waves, a forward wave into the load and a backward wave from the load . The reflection is dependent on the impedance of the wave line, the length of the wave line and the complex load impedance. The reflection of electronic circuits is too a measure for the attenuation ripple: A normal reflection of 20 dB then will give only a peak ripple of 0.044dB. So normally, in case of p >20dB we donut care about the attenuation ripple. After some algebraic work, the result for the reflection is a quadratic equation with two circles. One for the resistance’s and an other for the reactances: The graphical representation of these circles within the maximum reflection circle r = 1, leads to the basic Smith chart of Fig2. The reactance circles outside from reflection circle p = 1 are cut off. 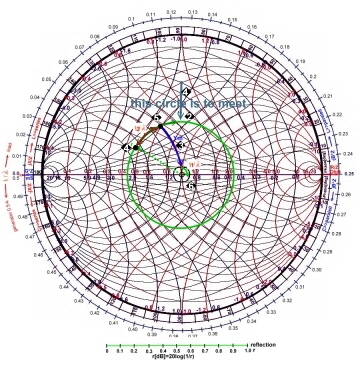 Here, the impedance’s in the Smith Chart are normalized to standard impedance’s Zo or the input impedance Z . Then R=1 becomes Z. 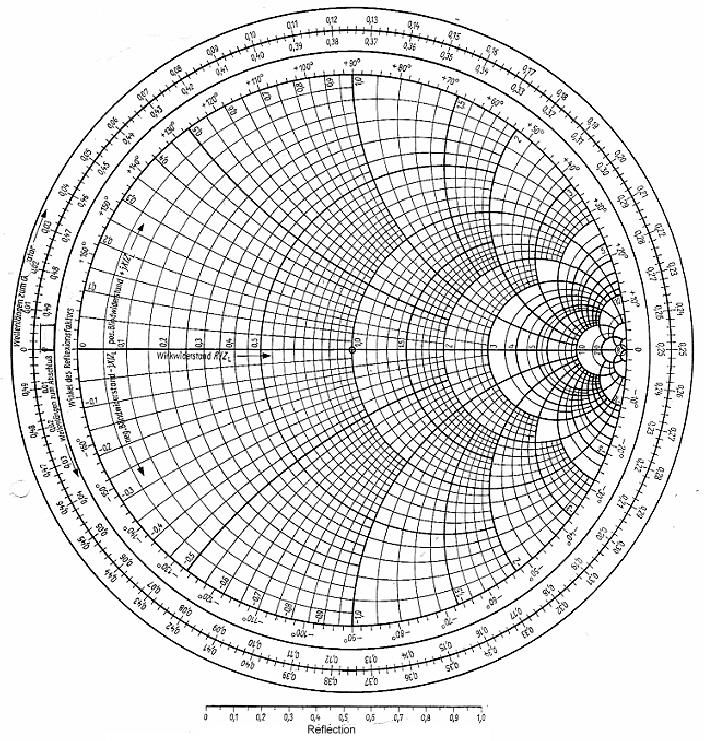 It is obvious that in place of reflection, all the other complex values may be used in the Smith chart. 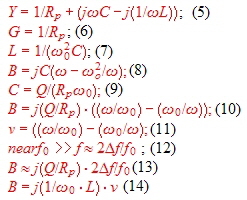 Even the solutions of large equations, when simplified with a computer program to u + jv. Using wave lines, the reflection is an other circle pointer: The reflection here is dependent on the propagation . We get : The reflection circle for wave lines is therefore scaled in normalized values of the line length to wave length. . Fig. 3 shows these circles, either toward the generator (blue) or to the termination resistor (red) . The phase is an other circle (green). These are just scales, the reflection itself is somewhere within the outside maximum reflection circle. 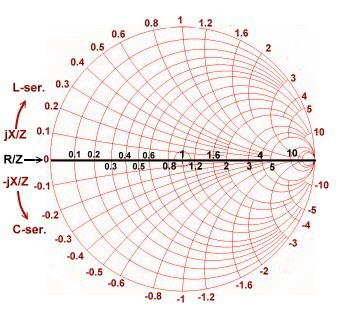 The main purpose of the Smith Chart is to match RF and microwave units, filter and line inputs and outputs, to get a small reflection r = p =15 to 30 dB. 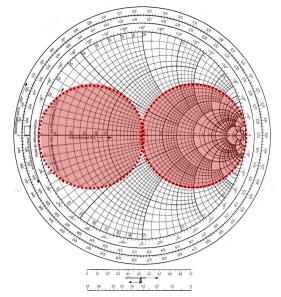 Fig.4 Summary of circles in the Smith chart. In a real paper smith chart all circles are combined in one chart Fig.4 . 2 Constant Reactance X/Z circles . 3 Reflection r circles, radius scale is outside. 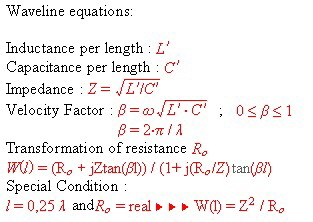 4 Constant resistance R/Z circles with positive reactance scale. 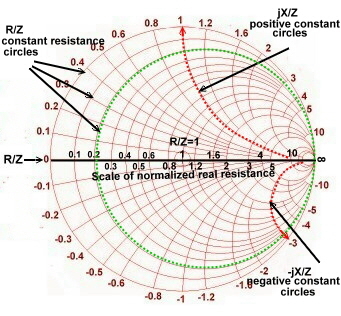 5 Constant resistance R/Z circles with negative reactance scale. 7 Wave length circle l/lambda to generator. 8 Wave length circle l/lambda to load. Transforming of impedance’s to Admittance’s and vice versa. Matching of RF Units and cables. Improvement of Wave Guide resonators. 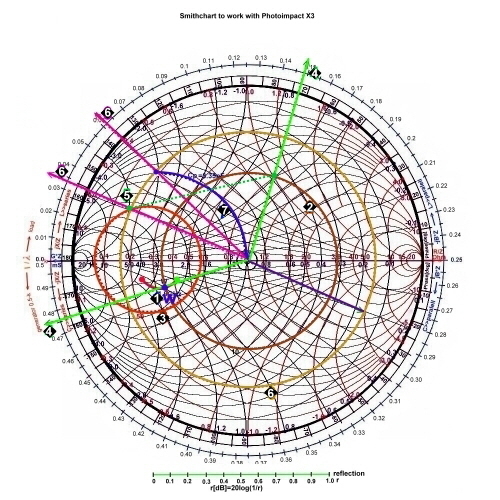 Dr. Henne Fachhochschule Augsburg : Die Smith Chart 1963. Z-Match for Windows / Number ONE System Limited 1994. Some people like to work with paper smith charts. 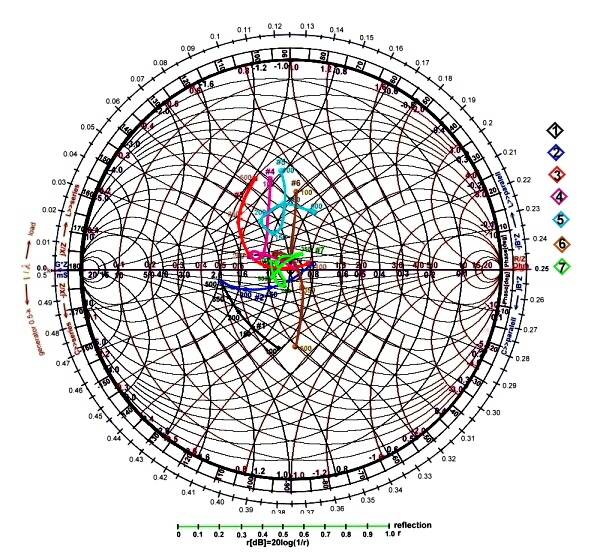 Here are readable, high resolution precision smith charts . Copy, enlarge it in a graphic program with zoom 200 and print . 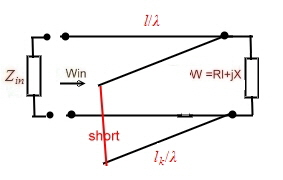 For strip lines and wave guides the reactance X and subceptance B depends from the mechanical design. For instance: Short stub wave lines can be positive or negative. 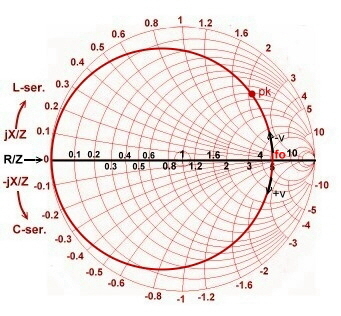 Fig.1 Smith chart for impedance’s without wave length scale. 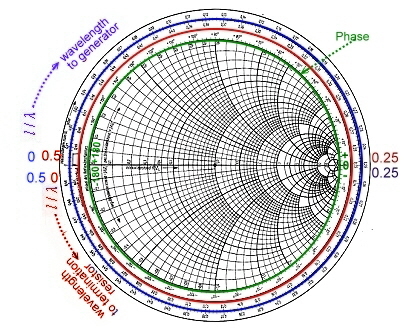 Fig.2 Smith chart for admittance’s without wave length scale. 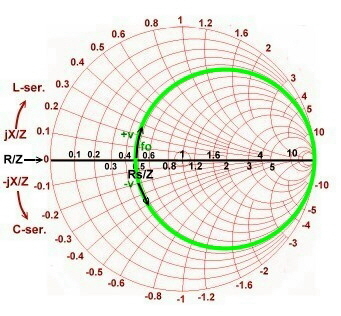 One of the important thing while working with the smith chart, is to change from impdance values to admittance values and vice versa.To implement this change of impedance to admittance to overlap some electronics developers, the impedance and admittance diagram. This may be somewhat confusing as Fig.4 shows . Another option is to work in the impedance diagram and change to admittance as follows: The admittance point is at 180-degrees on the same reflection circle as Fig . 3 shows. The change from admittance to impedance is vice versa. We always must know, what we just use, the impedance chart, or the admittance chart. We find : G = 0.33-j0.66. At Fig.4 the point W becomes G but keeps on its place, the scales changes. 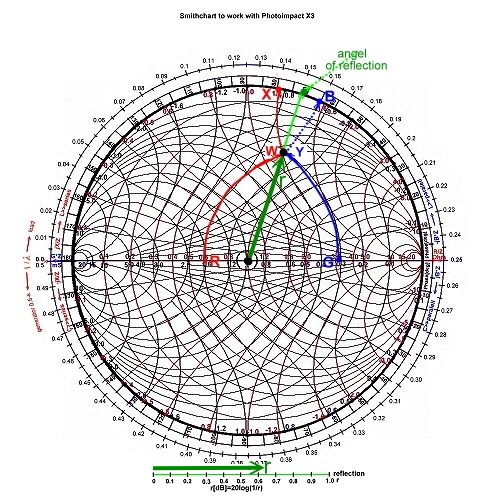 Fig.4 Impedance and Admittance chart overlaps. At f =100MHz the circuit could be: R=151 Ohm parallel with L=119.3 nH or 30Ohm in series with L=21nH. 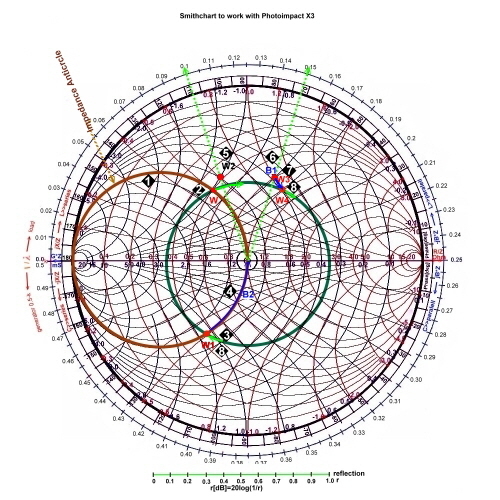 Working with the impedance - admittance Smith chart, in a graphic software. In the following examples, we will use the simplified chart of Fig.00 (to the right >>>>>>>>) in a graphic software for instance photo impact X3, and a pocket computer. This simplified view is a rough diagram of overlook-planning . Here we can use points, lines and circles in different colors, to realize complex broadband matching networks . While working, we must always know what type of chart we use just the moment to focus on this chart. The graphics charts on this site may be copied directly to be used with "zoom 100" in a graphics program. 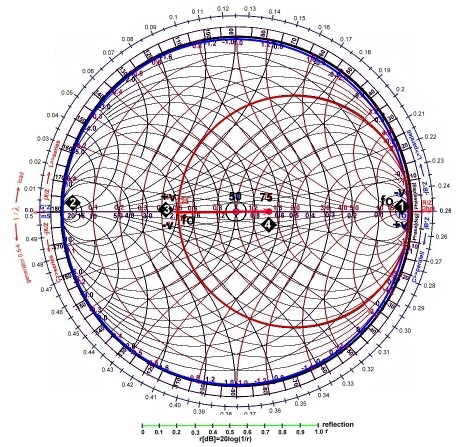 .During the design of circuits with the Smith chart, there seems to be always many solutions, but not all of these solutions are acceptable. To keep the order during the work, I use a solution tree and write down and save all the roads that I've been trying to get a solution. Using a transformer in the chart, means, a point W is moving the factor n*n on the R/Z scale. In case of n=1,42; n*n =2 and W/Z=1+j0.1 the transformed impedance is W/Z=2+j 0,2. This is true too for tapped coils. 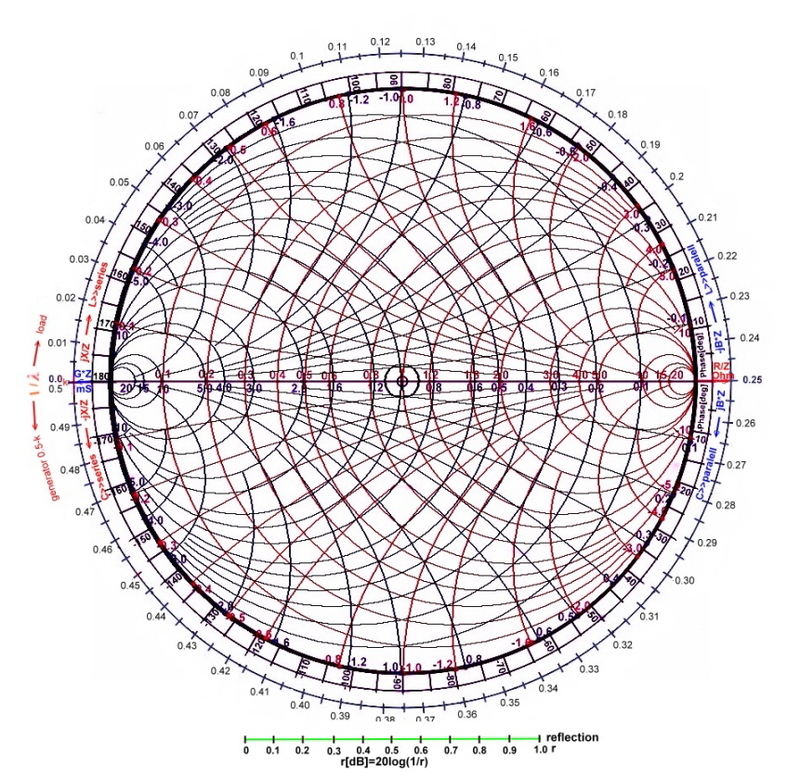 Wave lines in the Smith chart. .
W = 100 + j80. Now we will it into the chart. To normalize with 75 ohms means the center of the Smith-chart R/Z=1 on the real line is 75Ohm. Now we go along this line (red) to the R/Z value of 1.33. Next is to go up along the reactance circle of 1.33 to the X/Z value of 1.06. Thats the point of W in Fig.1. Now we can see how match is the reflection. The reflection is the radius of a circle around the point R/Z=1. (green circle) Every point on this circle has the same reflection. Using the reflection scale at the bottom of the chart, we read a value of reflection of : r = 0.42,, this means r = 20log(1/0.42) = 7.35 dB,; angel = 48deg. Finding of the admittance-value Y of W is very easy , we focus on the admittance chart and find in Fig.1: Y*Z=0.47-j0.36 . Now we connect W with a 75 ohm line with a wave length of 30 cm and epsilon = 1. (Fig.2) to the input. We calculate from the frequency : lamda=c/1Ghz; l =30cm, l/ lambda = 0.2 . We go straight from W to the outer wavelength scale and find the point: l/ lambda=0.184. Fig.2 Example of wave line and reflection using the impedance chart. Now we have to clarify the length of the wave line. We have epsilon =1 and l=30cm, but what will be the length x of the wave line if epsilon has some other value? If epsilon increases, the wave line must be longer. The following formula is valid : . We see different line impedance’s in series, causing a jump of W or Y values. Different strip line impedance’s, therefore are often used to match Impedance's. In the above example, we looked to the load, so we had to increase the wavelength in the clockwise direction. In the case of known Win, looking from point 1, we need to rotate counterclockwise. Up to now, we used the wave line as Impedance's. We also can use a wave line as an admittance’s in a parallel circuit . Admittance’s of short stubs are an important tool in the highest frequency technology. At microwaves, they have the advantage of easy tuning of matching using little paralleled screws, holes, or irises. But watch out for broadband applications, the impedance’s of the short stubs are repeated with the frequency due to the tangent formula. 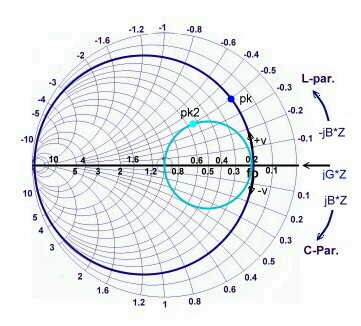 The paralell resonator in the smith char t.
Resonators are very useful for broadband matching using the Smith Chart. Look the resonator at Fig.1. Ro represents the losses from the unloaded Q. Q can be loaded with a additional external resistor Re to be used for matching. Rp=Ro//Re and QLOADED=Rp/(wo*L). We have found, that the conductance comes from Rp . The susceptance depends (14) on L, whose values are changed at higher frequencies by the parasitic elements. 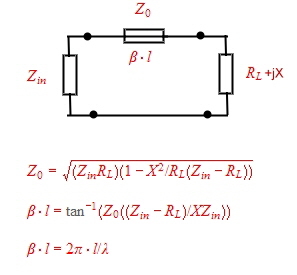 If we normalize with Z for working in the chart , the normalized conductance will become Rp*Z (6) and the susceptance B depends on the detuning v and from its sign. : Therefore adjusting Rp and v, total of admittance changes. (10).This is helpful to adjust a matching circuit. (11) = v = detuning. 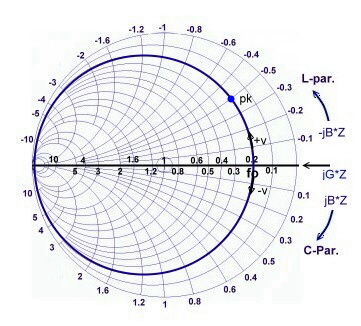 Fig.3 Parallel resonator circles in the impedance smith chart. 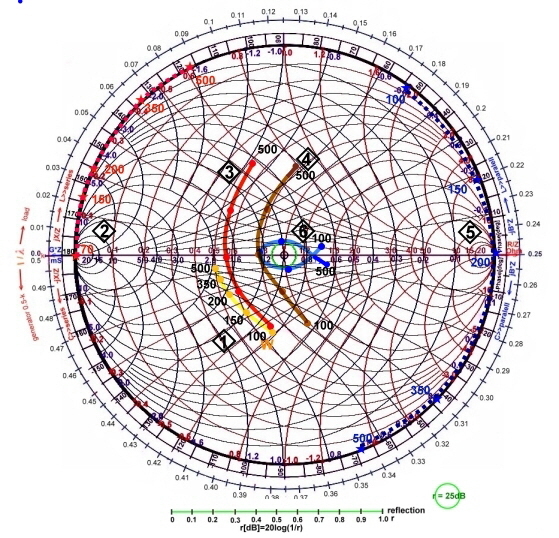 The parallel resonator circles, are are the same circles as the conductance G circles in the admittance chart. Resonance frequency fo is is on the real scale. R/Z=Rp/Z. The subceptance is depending from: fo, L and v .
The parallel resonator has 4 parameter’s to adjust for matching : fo,L,v and Rp. 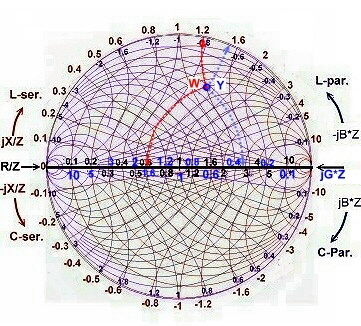 parallel resonator Using a little computer program for this formula , which changes to polar coordinates adding phase and vector , we can directly go to the impedance smith chart. 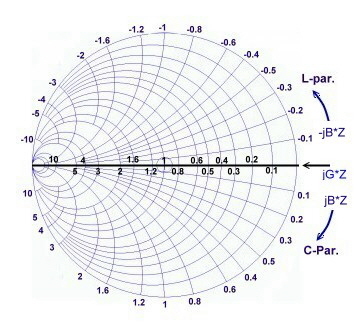 The circles of the series resonator are jX(v)/Z circles of a constant Rs/Z Fig.5. 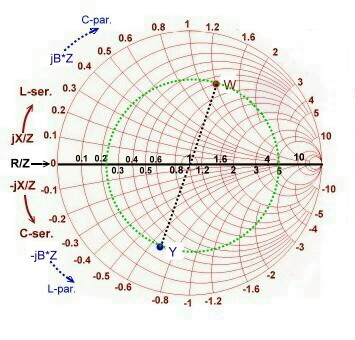 Draw Rp/Z and B*Z(v) into an admittance smith chart. Change to the impedance chart. 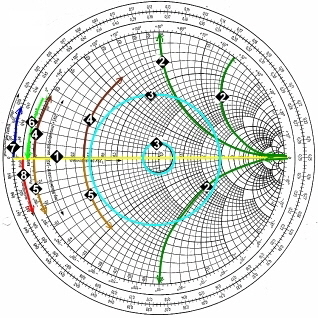 Electronic matching , using the smith chart . Fig.1 Matching from the load to the input. Matching design begins on the load W , then matching to the input . Matching design begins on the input , then matching to the load W.
Matching design begins on the input and the output. 1; W1 is on the 100Ohm impedance chart. 2; Change to the admittance chart. 2; Use an susceptance jB*Z= 0.38-0.15=0.23; along the conductance line to the G=1 line..
3; Change to the impedance chart. We match the point, W3, who is the input impedance of an RF transistor at 100 MHz Fig.1, to a 300 ohm antenna input. 8; W3 is on the 300 Ohm impedance chart . Using a series capacitor, shifts W3 along the R/300=0.3 circle to the real axis. Next work, is a jump, using an RF-transformer from R= 0,3 to 1. 7 ;The ratio is Rout/Rin = n*n; n=sqr(1*300/0.3*300)=1.8;. We match the point W2, which is the input impedance of an RF component, at 200 MHz to a 50 ohm coaxial input. 4; W2 is on a 50 Ohm impedance chart. Due of DC Blocking, the matching circuit must have a series capacitor. 6; Changing to the admittance chart and going up along -jB*Z until the R/Z=1 constant circle, is met. A classical transistor B or C power stage has not only to be matched, the matching circuit must have a transmitter tank, having a loaded Q of 5..10. The input of an output stage is matched using a Collins filter as a tank, Fig.1, between two transistors. 1 Basis input resistor : R/Z=19.2. 2 C1 tank capacitor: 18pF. 5 Collector output resistor: R/Z=1 >>25Ohm. Matching-Example #5 : Matching of Impedance’s using only one Wave line. Matching-example #6: Matching direction from input and from the output. 1 Use the admittance smith chart. 2 Estimate a practical reflection r circle aground G=1. 4 Design a matching circuit from the load W to match some where the reflection circle. 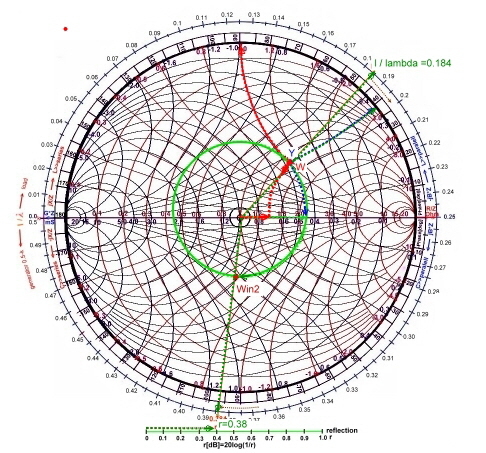 5 Read the l1/lamba from the smith chart scale along the circle. 6 Chose a practical value for 12/lamda. 7 Compute the wave line or wave guide length11 and l2. In the same manner, the Impedance circuit of Fig.1 can be used. 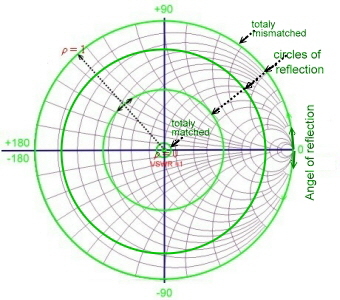 The radius of the reflection circle is: r=Zm/(Zm+2Z). 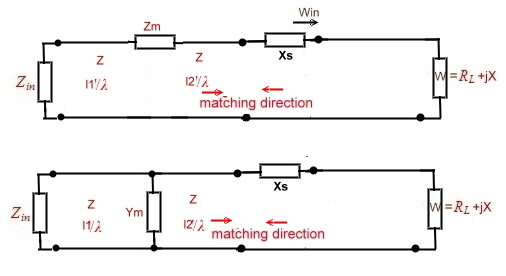 Matching-example #7 : Matching of Impedance’s using several wave lines having different Z. One method of matching is the use of several series connected wave lines, having different Impedances. This method is best solution at very high frequencies, when the use of lumped elements is not possible. We begin with Fig.1. We want to match the output impedance of a microwave power transistor at 1.9Ghz, W=3.4-j0.13 to a 50-ohm input, with a reflection of at least 25 dB. 1 The point W1 is normalized from the Data book at 10 Ohm. While this example, we change the normalization step by step forward and backward. 2 First we match from the input using a wave line with Z=50 , from R/50=1 to a value of R / 50 = 2. jX=0 we say. We choose a wave length of the 50 ohm line l /Lamba =1/8. The next action is drawing of a reflection circle around R / 50 = 2 . This is the circle to met if matching from the load side with a Z=25Ohm impedance which normalized to 50Ohm will jump from R / Z = 2 to 1. 3 Now we change the direction in which we adapt, working from the load and decide to use wave lines of 10-15-25 ohms, to to achieve the 25 ohms reflection circle. We don't care , about the necessary l/lambda values and draw a normalized 10 Ohm reflection circle around R / 10=1where the the point W lies. 4 We draw a reflection circle of normalized 15 ohms from the normalized 10 ohms circle real values, by multiplying with 10/15, moving to the left. 5 From this we draw an normalized 25 Ohm reflection circle from the real values of the 15 Ohm circle, multiplying this circle with 15/25. 6 Now we must find two points where the 15 Ohm circle and the 25 Ohm circle follow the values W25=W15*15/25. 7 The same we must do for the 10 and 15 Ohm circles. 11 from the 25 Ohm circle a 50 Ohm line transforms W=jX+0 direct to the center. 8 10 Ohm circle : l/lambda =0.088. 9 15Ohm circle : l/lambda=0.104. 10 25 Ohm circle : l/lambda =0.132. 11 50 Ohm circle : l/lambda =0.125. From the frequency of W we can compute the length of the strip lines at epsilon=1. You can make a comprehension exercise and repeat the operation at 2 GHz of W (red) and 1.8 GHz (green) of W, with the values from the length l , of the 1.9 GHz example, and see the reflection of the entire frequency band. Matching -example #8: Matching with different Z and Capacitor. 1 Draw the impedance W/10 in the chart . 2 Draw an reflection circle of W/10 around R=1. 3 Multiply this circle with the impedance ratio 10/50; and draw a Z=50 Ohm circle. 5 Transform this point with the impedance ratio and find a point on the 50 Ohm circle . 7 Take the difference of B to B=0; R/Z=1 on this circle and compute the parallel capacitor with deltaB*Z=2; f=1 .9Ghz >>>: Cp=2/(50*1.9E9*6.28)=3.35pF. Matching-example #9: Using parallel stubs. Matching by short stub was the classic method of adjustment, at a time, were not yet invented SMD capacitors. 1 First do do is, drawing the anticircle. 2 The Impedance W=50+j50 shall be matched and brought to the point R/Z=1 for a normalizing Z of 100 Ohm . 3 Next is to use a quarter lambda line , to move the impedance W to W1 on the anti circle. 5 The Impedance W2 shall be matched and brought to the point R/Z=1 for a normalizing Z of 100 Ohm . 6 First we use a wave line of l/lamba =0.05 and shift W2 to W3. 8 Next is to use a quarter lamba line and shift the W to W1 directly on the antcircle. Fig.1 Matching using parallel stubs. Matching-example #10: Parallel resonator and series resonator as matching circuit. Up to now, no reactance’s or susceptances are not used at all. In case of detuning the resonator, is it obvious, that the series parallel resonator circuit will realize reactance’s or susceptances depending on the detuning v.
r = 0 ---->> W(v)/Z+Wresonator(v)/Z =1+j0. Matching-example #11: Very broadband constrained matching , using one LC resonator . Matching-example #12: Lumped LC filter as as matching circuit. First we use a parallel resonator and add its susceptances B(f)*Z to the suceptances of W(f)/Z. Our goal is to move W(f)/Z into the direction of normalized 1 (50Ohm) and give this curve a circle shape, as small as possible. As Ro/50 = 188 the resonator susceptances lay on the outside circle. 0 .We use the admittance smith chard and add jB(f)*Z of W(f)/Z to B(f)*Z of PR an get 2. As Rs/50 = 0.01 the resonator reactance’s lay on the outside circle of the impedance chard. We add jX(f)/Z of 2 to X(f)/Z of SR an get 3. As Ro/50 = 100 the resonator susceptances are on the outside circle.We use the impedance smith chard and add jB(f)*Z of 3 to B(f)*Z of PR an get 4. We add jX(f)/Z of Ls to X(f)/Z of 4 and get 5. We add jB(f)*Z of Cp to B(f)*Z of 5 and get 6. This curve now has symmetrical positive and negative values; which can be compensated, using a series resonator having the same positive and negative values. Now we add jB(f)*Z of Cp to B(f)*Z of 6 and get 7. This curve now is almost near “1”: We find a reflection of 14 dB. Last work is to use a little resistor of 4 Ohm get the curve ifen closer to 1. Fig.2 shows the result , we have now r=18dB. As this calculation is not very precisely , in a practical carefully tuned circuit, can the reflection be matched better than 20dB. Fig 3 shows the matching circuit. .Now we have roughly designed a very broad passband filter, where the complex impedance W is part of it . The frequency band with low reflection is the passband. Outside the low input reflection is the rejection band. The total filter transmission must controlled in a transmission analyzing program, looking for all S parameters , improofing the circuit and then match again. 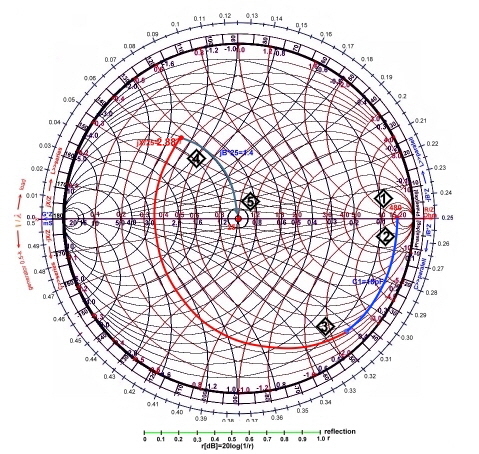 Matching example #13: Transistor matching using noise circles in the Smith Chart. 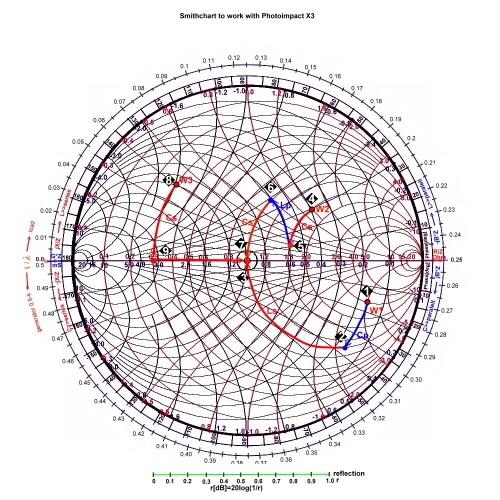 The smith chart is helpful for designing low noise circuits for low power low noise transistor amplifiers. Fig.1 shows the situation at a certain frequency: Normally we take the transistor S parameters from the data sheet, and match the input and the output of the transistor for stable maximum gain and minimum ripple in a way, that input and output reflection are as low as possible. For minimum noise the transistor input has to be matched with specified reflection . But first we need to determine the the load reflection coefficient . 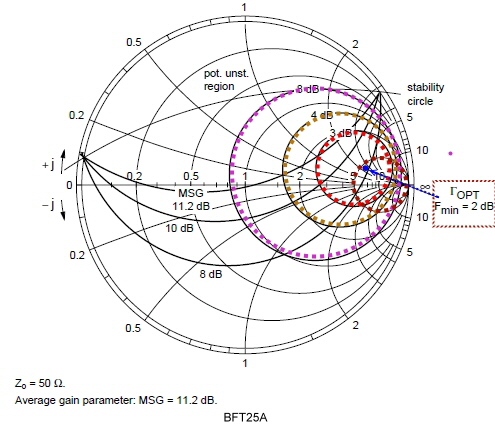 So we have to match the load impedance to S22 , and read in the Smith chart. Minimum noise from the datasheet. Normal , noise circles are given in the data sheets of transistors. Fig.1 shows an example of noise circles and . The noise circles are places for reflection ,at the the transistor input. To gain the wanted noise figure, must be inside the wanted F circle and then being matched to Zin .